In collaboration with the Natural History Museum of Los Angeles and the National Park Service, La Kretz Postdoc Joscha Beninde is conducting a comparative landscape genomics study to understand how species survive and thrive in urban environments. 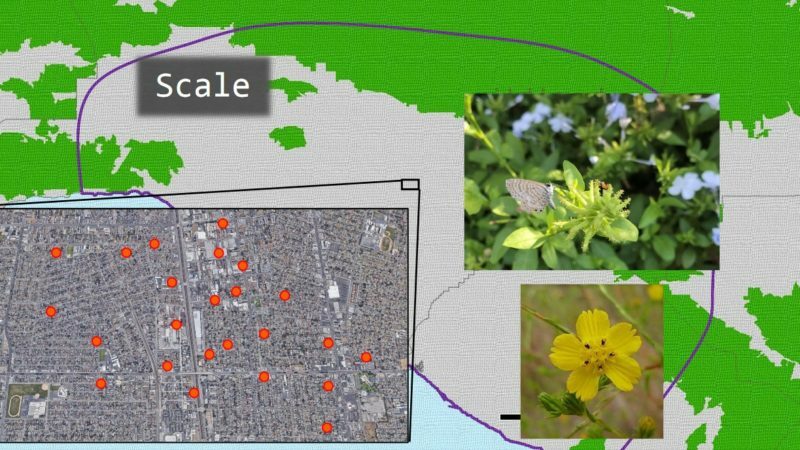 Incorporating twenty species of plants, butterflies, spiders, phorid flies, slugs, snails, lizards and small mammals, spanning the Greater LA urban region, he will identify the factors driving gene flow across taxonomic groups. His goal is simple: to increase the biodiversity of native species across our city. While roads, traffic, impervious surface and other anthropogenic factors may spring to mind when thinking about the obstacles species face in urban areas, Joscha’s previous work on urban lizards in Germany showed that natural factors, such as rivers or canopy cover, impact gene flow most strongly even within cities. But Los Angeles dwarfs his previously studied cities by several orders of magnitude and will offer unique insights into patterns of gene flow at the urban-wildland interface.